When you use for copying commands the same keystroke, at Copy Paste will MultiClipBoardSlots displays the selection menu! Since you probably use a shortcut for several commands, this is sometimes useful, the context selection menu appears at the current mouse position! (Image-1) Copy Paste actions show the selection menu"
MultiClipBoardSlots - FAQ-2: Why at Copy Paste actions show the selection menu on Windows? I have Problems With Excel Copy and Paste Multiple Selections in Multi Clip Board Slots? In my Custom cut copy action bar for Edit Text Multi Clip Board Slots shows a menu? Custom Text Selection at paste actions with Multi-Clip-Board-Slots Selection Menu Opens? 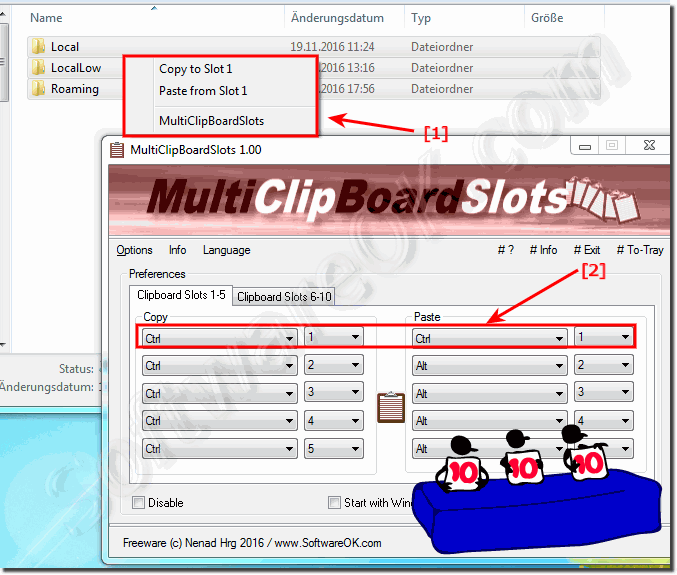 Multi-Clip-Board-Slots Copy, Cut, and Paste Operations Selection Menu Opens? Copy and Paste Multiple Layers Multi-Clip-Board-Slots Selection Menu Opens? Multi-Clip-Board-Slots Paste into selection is not working Selection Menu Opens? If I make Paste Options button disappear after you paste in Excel Selection Menu Opens in MCBS? Select, Copy, and Paste feature Multi-Clip-Board-Slots not working Selection Menu Opens? I paste the string, and get the clip object from the clipboard slot 1 and copy the string to slot-2 Multi-Clip-Board-Slots not working Selection Menu Opens?